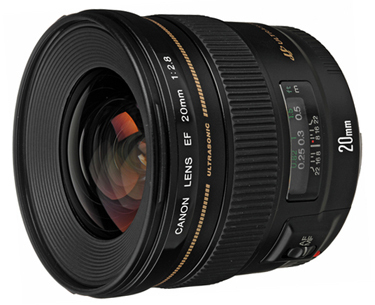 The Canon EF 20mm F/2.8 USM is an ultra wide angle lens that boasts a robust design including a metal filter ring, metal hood mount, and metal forebarrel. Its floating rear focusing system and Intelligent Field Curvature allows for sharp focus especially at the outer edges of the frame and is unique to this lens. It can be paired with both full frame sensor cameras, such as the Canon 5D Mark III, and with crop frame sensor cameras, such as the Canon 7D Mark II. The focal length equivalent on crop frame sensors is 32mm, which is wide enough for events and street photography and just long enough for portraits – especially group portraits. This is a handy lens to have when you want a wide prime with not as much distortion as you would expect from something of this focal length and is great for interior and architectural photography. • This lens is compatible with Canon EF mount cameras in both full frame and crop frame sensors. The focal length equivalent on crop frame sensors is 32mm.